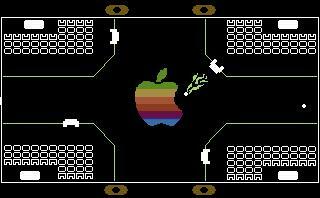 "New multiplayer game for the Apple IIgs"
��� Fight 3 of your friends in this fast action multiplayer game.� The goal is simple, knock down your opponents castle and hit his player rectangle with the ball.� Control your player with the keyboard or joystick.� This is a port + enhancement of the old Atari 2600 game Warlords.� There are extra features like extra balls, flaming balls, extra weapons, screenhole warps, background graphics, "tilt" feature, and extra enemies. ��� The game keeps track of high scores.� You can design your own background graphics with a GS paint program and display them during game play.� Music can be played in the background with a music player NDA.� There are several excellent sound effects in the game, like when the ball bounces off of wall,shield, castle. ��� This is an Apple IIGS *desktop* program programmed in C.� Source code available.